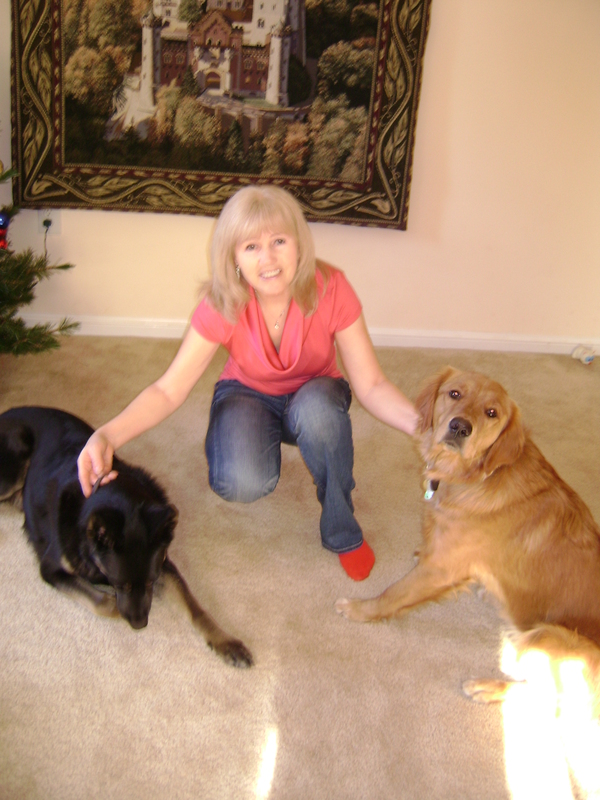 I haven’t blogged in four months! Not for lack of time, though. Or for lack of words. I always have something to say about the books I read or the book I’m writing at the moment. And I did, too, these past months. After all, I’ve been reading voraciously, as usual, and I’ve kept working on my novel as well. But I wasn’t in the mood for reviewing anything, much less discussing my work. Needless to say, I was STUCK. My novel, a sequel to A Measure of Guilt, was already finished last year, but, even after several rounds of revision, I still didn’t like it. 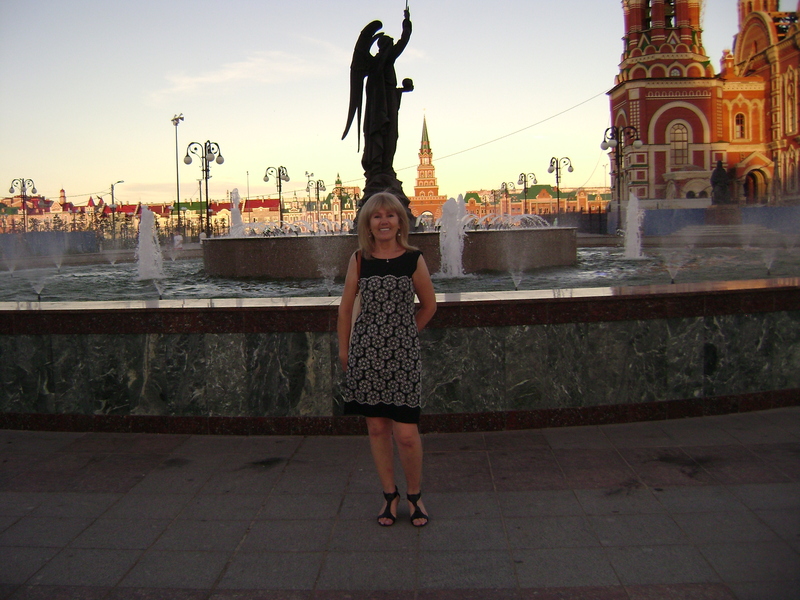 I felt disconnected with the place (Moscow, Russia) where my protagonists spend ten days. That, in addition to being dissatisfied with the plot, the subplots, the voice, the flow, you name it… Everything seemed bad. So I needed a boost. In what form? The answer was clear. I had to fly to Russia. Just had to! I had to walk those streets, breathe that air, observe and talk to people, eat at local restaurants, drink at bars…in short, feel that atmosphere. So I took a three-week-long trip. And I did all those things. And I loved every minute of the time spent in that country, my previous home. Today is the end of my 30-day journey, which is actually the end of the beginning. That is, when I finish my fourth novel, I’ll get back to this one (novel #5), and I will pat myself on the shoulder for having written two-thirds of its first draft. Working on The Unknown gave me a much needed respite from my novel-in-progress and now I can resume revising it with fresh eyes. It’s only half of the novel, really, although I haven’t even gotten to the middle of it. So I’ll have to write twice as much in order to have something to work with when I start my second draft. I love to be in a state of anticipation. (And who doesn’t?) So it was fun to get to the computer every morning with no idea whatsoever as to what I would write about today (Where will my characters take me? What will they say? What will they do? How will they surprise me? ), and then type the first few sentences of a scene and…keep typing for 3-4 hours, and voila! The scene is there, on the screen! I wrote on average 2600 words daily, but today I…um…slacked and did only 500 words. Well, there’s always tomorrow, right? I still have ten more days. Ten days down, twenty more to go. 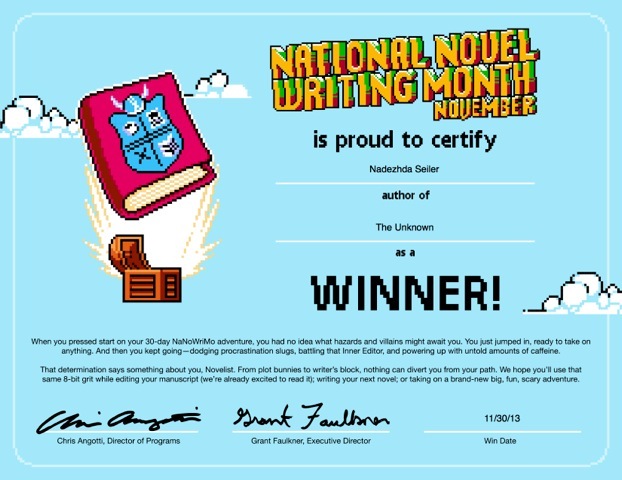 I’ve just completed my daily quota and submitted a total number of 25,000 words to the NaNoWriMo website. Which is, I’m happy to say, exactly half of the required amount of the first draft of a new novel. 50 K in 30 days is the writing goal for the participants of this particular writing marathon. Of course, 50,000 words are not enough for a good-size novel. It would be more like a skeleton that would be beefed up later on. But my problem is that I can’t ever write just a skeleton (the beginning, stating a problem; the middle, describing the complications that lead to a climax; and the resolution of the problem). What I usually end up doing is typing down everything that comes to my mind, without sticking to a plan. Well, because I never have a plan to begin with. Besides, I can’t just tell my characters to shut up and stick to the facts. If they do a lot of introspection and reflection and reminiscing, my job is to write all that down immediately, instead of filing it away for later. As a result, my books are heavy on flashbacks and inner thoughts—always. Thus, I’m afraid that I won’t finish this new novel’s first draft by Dec. 1st, even if I knock off 80 K words, which is my goal. A bummer. Because I promised myself that I would take a break from my 4th novel for one month only, and would resume working on it come December. Yay! I just posted the first 1,945 words of my new novel on my NaNoWriMo page. It’s a start. Not a bad one, considering that the daily quota is 1,667 words. By the way, my tentative title is The Unknown, which reflects both the premise of the novel and my present ambivalence as to how to execute it. Luckily, I hadn’t forgotten that idea. In the morning, it took me only an hour to knock off a thousand words. Light-hearted and light-footed, I went off to my yoga class. In the afternoon, I wrote another thou. I should have posted all that and enjoyed the rest of the day. As a result, I spent HOURS editing it afterwards. Which was a big mistake. Your very first draft should come from your heart and your gut–authentic, emotional, raw. It’s like a stream of consciousness. It’s usually garbage, of course, but you can find real gems in it–later. Well, I made this mistake today. I won’t repeat it tomorrow. Starting tomorrow, I’ll just write what comes to me. Novel in Progress: Taking a Break! I finished the third draft of my fourth novel and it’s still unreadable for anyone’s eyes but mine, so I decided to take a break from it. Luckily, National Novel Writing Month is presenting me with this chance. Yes, I consider it a present. If not for this gift, I would’ve never put this novel aside, but kept toiling over it, even if hating it, some days. Most writing instructors believe that a few months-long hiatus from your manuscript is absolutely necessary because your coming back to it will be quite rewarding: you’ll be able to see your creation in a different light, noticing the flaws that you’ve previously missed, coming up with ways of fixing them and improving your book overall. And that’s exactly what I need right now. Not only because of the much needed hiatus, but also because of my plan to eventually write a sequel to this book, so I figure why not knock off its first draft now? I’m sure a sequel will help me with its prequel, i.e., my current novel. It’s actually funny that just a month ago I didn’t even think about starting yet another novel until I completed this one and got it published, and now I’m ready to launch its sequel. How do I feel about this new endeavor? NaNoWriMo starts tomorrow, Nov. 1st, and ends at midnight on Nov. 30th. But of course, it’s easier to say than do, because at this moment, except for a general idea for my newest creation (and two main characters), I don’t have anything in my mind. So how do I execute this idea? I don’t know. But! Since I’m an organic writer and never plan my first draft in advance, I’ll take my usual route—I’ll give the reins to my characters and see what they’ll do and say. Amen.